Hermit crabs used specialized setae on the their maixillipedes and fifth pereiopods for most grooming but used the unmodified first, second, and third periopods as well. 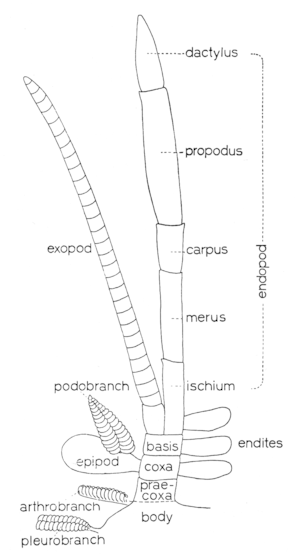 Most brachyuran grooming was performed with modified setae on the the third maxillipedal palps and eipods, with a row of simple setae on each chelipede merus, and with the chelipede fingers. Pereiopods are primarily walking legs and are also used for gathering food. Those pereiopods which are armed with a claw (chela) may be referred to as chelipeds. The moveable fingers of a claw are known as dactyls. The pereiopods bear the sexual organs (gonopores), which are the third pereiopod in the female and the fifth pereiopod in the male. Land hermit crabs are able to regenerate lost appendages with molt.